Soaking porridge overnight not only makes it cook more quickly in the morning and makes it creamier too, but it also means the hardest part of making a hot breakfast is stirring the pot every now and then. 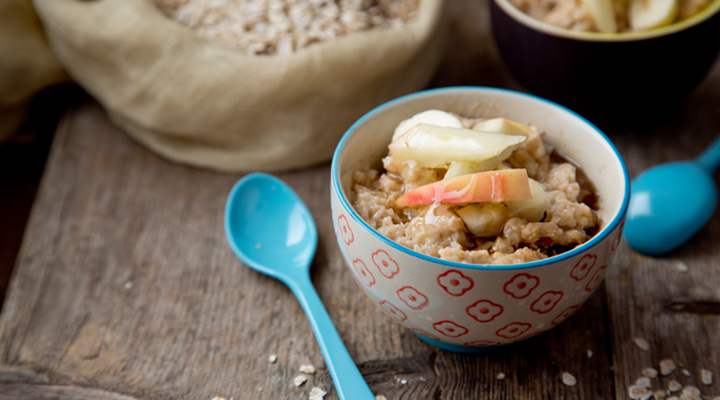 Adding some grated apple overnight is a good trick used in cold bircher muesli recipes, but it works just as well in a hot porridge too. 1. Place the oats and milk in a medium-sized bowl and stir to combine, then stir in the mashed banana, grated apple, brown sugar and a pinch of cinnamon. Cover the bowl and place in the fridge overnight. 2. The next day, transfer the porridge to a pot and set it over a medium heat. Cook, stirring regularly, for 5 to 10 minutes, until the porridge is thick, creamy and piping hot. If it’s getting too thick, though, add another splash of milk. 3. Divide between two bowls and top with fresh fruit or berries. Tip: This porridge is good at any time of year, not just in the winter. In the summer, try topping it with fresh peaches, nectarines, apricots and berries. In the winter, pears or a dried fruit compote would be fantastic.